Finding a good organic pre-workout supplement is a difficult task, even though there are not that many options. 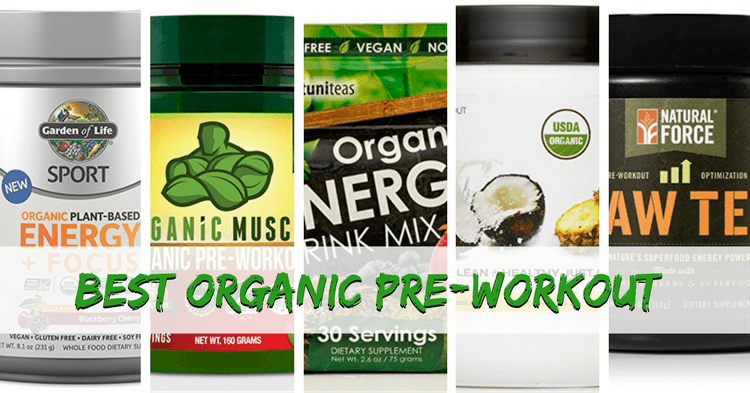 The list of ingredients you will find in organic pre-workouts is very wide. But not all of them will get you fired up for your workout. If you are looking for the absolute best organic pre workout, this article will go right down your alley. We have reviewed some of the best organic pre-workout supplements of 2019. We are going to look at the ingredients list, the effectiveness of the pre-workout and lastly but not least the taste of these products. 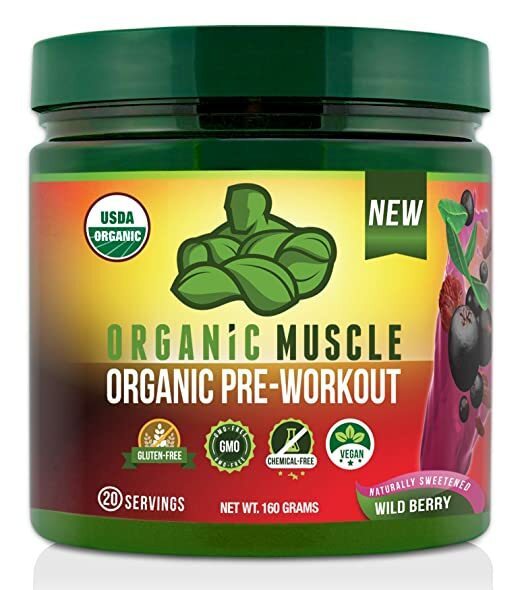 An organic pre-workout is a powder like supplement which contains only organic-based ingredients. 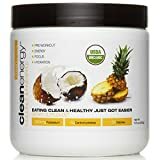 So, instead of having all the regular substances such as Beta-Alanine, Citrulline Malate and Betaine, you will get only organic, plant-based ingredients. These ingredients are chemical-free and are not genetically modified in any way. All the plants and herbs are also free of herbicides, synthetic pesticides or antibiotics. The whole purpose of using organic products is to get them more easily absorbed and processed by the body without make you feel cracked out or having insomnia after taking your pre-workout. 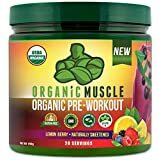 This article covers only organic pre-workout products. You may also want to check out these natural pre workout supplement as well. If you are like me and like everyone else for that matter, I bet you had days when you felt tired before getting to the gym. Maybe you even had days when you felt like not going to the gym at all. That’s fine, we all have these struggles. That’s when pre-workouts come into the picture. They are known for giving you that kick and boost to get you going through your workout and throughout the entire day for that matter. But what happens when you don’t actually want to take in all that artificial chemicals and substances? That’s a legit question. I mean, yeah getting a boost of energy is great. But, is there any way to get all that without throwing a whole bunch of crap into your system? Well, that’s where organic pre-workouts come into the picture. These products use 100% organic products, no chemicals, no added sugar and no artificial stuff. 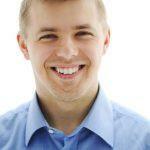 As in any food or supplement, the main thing you want to carefully look at is the list of ingredients. And organic pre-workouts are no exception. There are tons of all-natural good ingredients that you want to have in your pre-workout. But let’s keep things simple and outline just the 3 most important ingredients you want to have in your organic pre-workout. Green tea matcha powder is probably sitting at the top of the list in organic pre-workouts. Besides giving a decent boost, this miracle ingredient can increase fat loss by up to 25% during your training sessions. Caffeine is a well-known ingredient which is found also in most organic pre-workouts. It is proven to increase your alertness, your ATP production but also your strength. So it can help you get a better workout, move more weight and build more muscle. Yerba Mate is an ingredient that has a big hype around it lately. It is known to have effects similar to caffeine and some organic pre-workout manufacturers started including it on their products. Besides the ingredients list, another important thing you want to look at when buying is the taste and flavor. This is not something you can experience before you actually buy the product, but let me give you a little hint. When you are looking at the label, if you see at least 15-20 kcal coming from sugars or carbs, that gives the product a pretty good chance of tasting decent. I am saying decent because none of the organic pre-workouts will taste like regular pre-workouts. Because of all the plant extracts used, most of the times organic pre-workouts literally taste like you are putting dirt in your drink. I guess all those health benefits come with a price after all. As in any other pre-workout, the organic ones are no different. Good products require good ingredients and good ingredients are expensive. So at the end of the day, you get what you pay for. Therefore it’s a good idea to check out the pricing and stay away from the lower end organic pre-workouts. Moving on, let’s look at the top 5 best organic pre-workouts you can get your hand on in 2019. 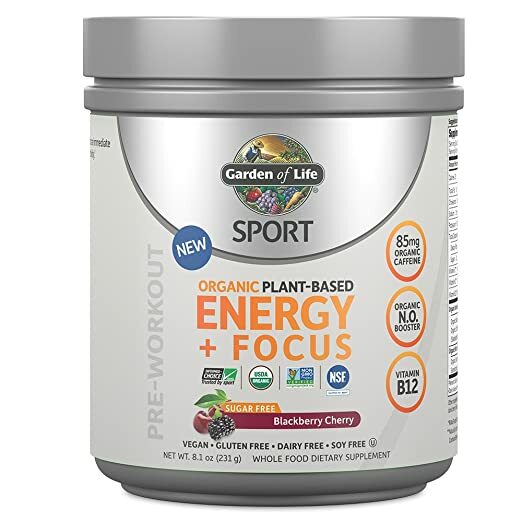 If you want a boost of energy and better focus during your training sessions, Garden’s Life pre-workout might be just the right product. This is an organic, plant-based pre-workout which uses organic coffeeberry (85 mg) as the main ingredient to fuel your body. For increased energy and ATP production, you get a whopping 220 mg of whole foods (Organic Kale, Spinach, and Beets) based Vitamin B12. If you are worried about stevia content, be informed that this pre-workout contains organic stevia extract from leafs. The USDA Organic Certification and Non-GMO Project Verified label stand behind the manufacturer’s statement that this is a 100% clean product. In case you are a pro athlete and are planning on competing, you can safely use this pre-workout. It is NSF Certified for Sport and Informed-Choice for Sport Certified, so no banned substances in there. As you would expect after reading the ingredients list, the taste is not the strong point of this pre-workout, but the energy boost is considerable. The main ingredient is caffeine – you will get 125 mg per scoop. 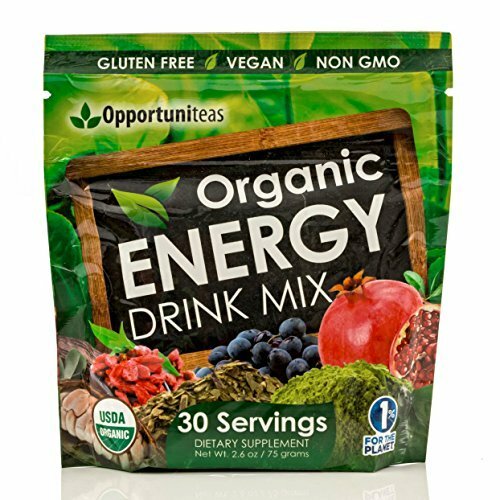 The 100% organic blend contains Ginseng, Maca Root, Yerba Mate, Beet Root, Eluethero Root, Goji and Acai, to name just a few. The downside of this product is the taste. The wild berry formula feels very artificial and synthetic, even though the product is a natural, organic pre-workout. You have the USDA certification to back that up. I guess this is just an outcome of all the leafs and roots they put inside the pack. The effectiveness of this organic pre-workout is above average. It will give you decent pump, but the energy levels will not be up to what you might expect. The caloric content is 25 kcal per servings, which comes mainly from carbs. This 30-servings organic pre-workout is one of the highest in caloric content, with 35 kcal per serving. Most of those calories are coming from fruit/plant-based sugars but there are a couple of grams of fat in there as well. The good part is that the taste and flavor of this particular product is absolutely amazing if you compare it to other organic pre-workouts. It feels so natural and sweet, even though there is no added sugar. The competition doesn’t have a chance to win this battle. Many users drink this as a substitute for soda, that’s how good it tastes. The main driver ingredient of the Clean Energy organic pre-workout is no surprise: caffeine. The source used for it is organic green coffee beans. You will get around 80 mg of caffeine per serving which is roughly the same amount you get from a small size cup of coffee. Other ingredients worth mentioning are Coconut Water, Organic Pineapple, Organic Lemon and Organic Matcha Green Tea. This pre-workout is USDA Organic certified. The effectiveness of this drink as a pre-workout is limited. You will not get a strong energy boost (some uses might not feel it at all). However, you might feel more alert and hydrated throughout the day. 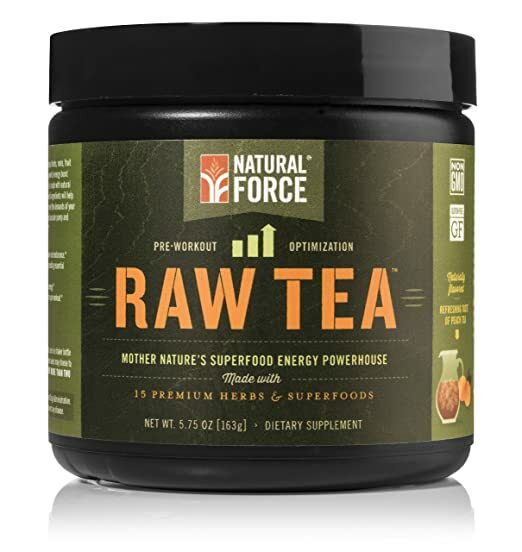 The Raw Tea organic pre-workout uses a unique combination of 3 different recipes, each of the recipes having its own goal. The organic bee pollen, cranberry juice, Asian ginseng root extract, Guarana and Maca extract are used as natural enhancers of energy, endurance, and focus. Beetroot, cranberry and elderberry juice extract, organic cinnamon bark and hawthorn leaf extract are used to improve blood flow and vascularity. Lastly but not least, the green tea leaf extract, Yohimbe bark extract, and bitter orange fruit extract will tap into the fat utilization. Even though there is no added sugar, you will get extra natural sweetening from the stevia leaf extract. The caffeine intake per serving is 100 mg which is just enough to get your energy level up a little bit. If you can’t feel the effect you can take 2 scoops. The taste is pretty bad even for an organic pre-workout. It must be because of all the herbs used. Another downside is that it doesn’t mix in very good with water. You get that grainy feel, mostly because of the bee pollen bits. This organic pre-workout features Yerba Mate and ingredient which has got a lot of attention lately. It is known to have the same exact effects of caffeine while offering the benefits of tea. So instead of the plain old caffeine, you get the Yerba Mate to keep you alert throughout the day. 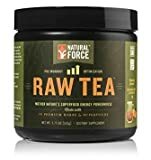 So if your body doesn’t respond well to caffeine intake or if you simply don’t want caffeine in your system, this organic pre-workout might be the right choice for you. The recipe behind the organic energy drink mix is pretty simple. The pre-workout is based on just 6 ingredients: matcha green tea, yerba mate, cacao, goji berry juice, pomegranate juice and maqui berry. So no gimmicks here. The flavor is decent, however, the organic ingredients blend doesn’t mix really well with water and feels a bit gritty. You can mix it in your yogurt, smoothies or protein shakes if you want to. One serving contains only 5 kcal and no sugar. Most users have reported a noticeable difference in the gym after using the product. It increases the energy levels and alertness significantly. To sum up the above mentioned reviews and make your decision a little bit easier we have selected our top organic pre-workout. The Sport Organic Pre Workout Energy Plus Focus by Garden of Life is our top pick because it offers a considerable energy boost and it is one of the few organic pre-workouts which is tested and certified from being free of banned substances. So if you are a competing athlete looking for a safe to use organic pre-workout this is a really good option. Organic pre-workouts are very tricky to pick. Most of them have a mediocre taste and not all of them will give you a decent energy boost. That is just how natural organic ingredients work. The majority of these ingredients will lack the power of traditional substances used in regular pre-workouts. So getting that kick and pump might be a little bit difficult. Do your research properly, read as many reviews as you can and start trying out for yourself different products. Different physiques may react differently to the same product.